I just received another package from Dinair! 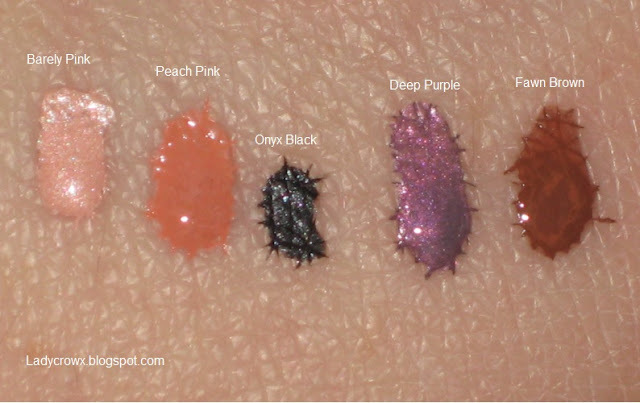 After my last post one of the PR's from Dinair was kind enough to offer me some more colors to review for my readers! 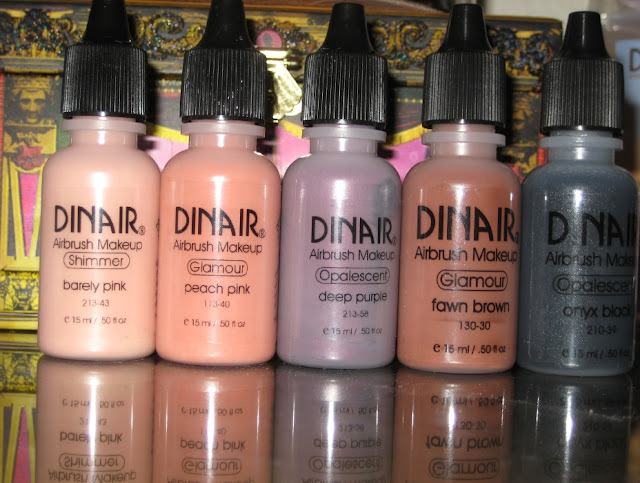 I got to pick out 5 new shades to test out and let you know what I think. I'm still loving my airbrush as it saves me a good 30 minutes (I take forever with normal foundations trying to mix the right shade because I can't find it anywhere :(...with this system I put a drop in of one shade and 6 drops of another and I'm good to go!) not to mention I tend to be unhappy with how liquid/cream looked on me as after not too long if not right away it looked cakey and ended up sliding even with primer. 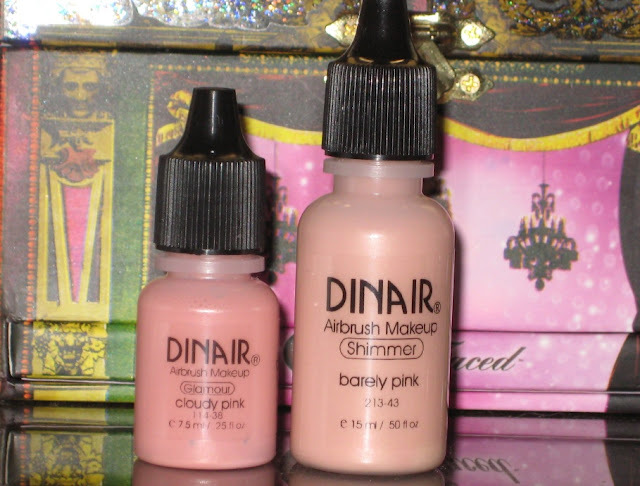 The Dinair airbrush system also allows me to cut out using concealer as I just use the airbrush to cover the flaws then do a general all over layer which makes it much more flawless than I could get with the other stuff and a brush/sponge. I also had the issue of buffing the cream/liquid concealers away when I tried to blend it the old way. I also don't use a powder anymore although I do take one with me for any touch ups if I cry...which is rare...I hope at least....or if I sweat which normally I don't and I've noticed the airbrush foundation doesn't usually budge even then...I hate to admit it but I fell asleep in this makeup....(I like to wash my face before bed to keep it clean) I am happy to admit when I woke up it looked really fab still and hadn't rubbed off anywhere! (might be good for sleepovers if you want to look good for your guy/lady in the morning! ;) Anyway let me show this stuff and stop chattering! I look forward to showing you guys some pictures of the products on as well as hopefully doing a video tutorial/review on my youtube channel! They were kind enough to send me the .50 fl $16 oz so I compared it to the .25 fl oz $12...I will be buying the bigger ones for sure when I get a chance to order after comparing them...although it doesn't take much to go a long way so I won't go through them fast! I've been using my foundation almost daily and it's barely got a dent! I look forward to trying these colors out in an eye look! I will do some pictures/possible video once I get a chance hopefully this weekend or maybe even tomorrow! 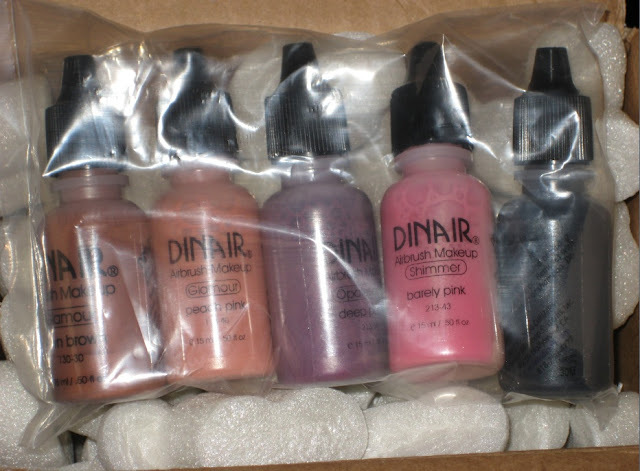 Again these colors were sent to me to review I did not pay for them I did however purchase the airbrush and the prior foundation shades/blush/highlight I showed in my earlier post!